Do you really trailer more than 5,000 pounds on a regular basis? If not, the non-Vortec six in the new Sierra is worth more than a second look, since it's rated at up to 7,200 pounds towing. The 2014 GMC Sierra gets a much stronger footing in its tug-of-war with Ford and Ram, thanks to new powertrains, new infotainment features, and great gas mileage. The GMC Sierra was overdue for a major overhaul as of last year, when its rivals began to outshine it with new looks and new powertrains. For 2014, the Sierra and its twin, the Chevy Silverado, get the deepest rework they've had since 2007, and emerge with some of the best towing and hauling figures of any full-size truck. At the same time, the newly revised Sierra also gets a strong base V-6 engine, an excellent V-8, and enough ports and connections to turn it into a mobile workplace. Both the Sierra and its sibling Chevy Silverado get new powertrains, nicer cabins, weightier styling, and a raft of new infotainment and safety features. As a result, they land much closer in our overall ratings to those current benchmarks from Ram and Ford. It was plain to see the Sierra needed a visual reshoot, after seven years on the road. We'd call the new look gentle progress to a roughneck style. The look is refined enough but striking in its blocky, bluff front end and its chiseled fenders. The bold black-and-metallic grille makes a strong first impression—as do the chunky, flared fenders and projector headlamps with available LED trim lighting. It looks big, as big as a Sierra HD, something that will appeal to many, but not to all. Inside, the dash is still upright, with a simple design livened by soft-touch plastics and real aluminum, and opened up more by lower doorsills. Controls are arranged in several key areas, just to the left of the steering wheel or in a large center-stack area (with a wide center console just aft). All are are large and straightforward, with cool blue primary lighting, red arms on the dials, and red backlighting. GM has updated its entire lineup of engines in the Sierra, with a new V-6 and two new V-8 engines, all with an aluminum block and heads and receiving direct injection, continuously variable valve timing, and Active Fuel Management—allowing them to run on just four cylinders when coasting or cruising in light-load conditions. If you're only into moderate towing, we'd study the V-6 carefully. It's quite capable, and the boost in torque and usable power means it could be time to rescale your powertrain ambitions. If you opt for the 5.3-liter V-8, your 355-horsepower result will be not so horrible gas mileage and muscular acceleration, combined with sky-high towing capacity. There's a 6.2-liter V-8 coming later, for 420 hp and 12,000 pounds of trailering. All three engines can be teamed with rear-wheel drive or four-wheel drive, and a six-speed automatic transmission (with a ‘cruise grade braking’ feature to reduce brake wear) is offered across the line. It's not eight speeds, and that's fine, since it's staged to deal with available torque in the best way possible. All models get electric power steering, and four-wheel disc brakes with special long-life brake rotors are standard across the model line. The Sierra's ride quality is a bit better than before; it's the steering that gets our attention, with its quick reflexes and just-right weight. 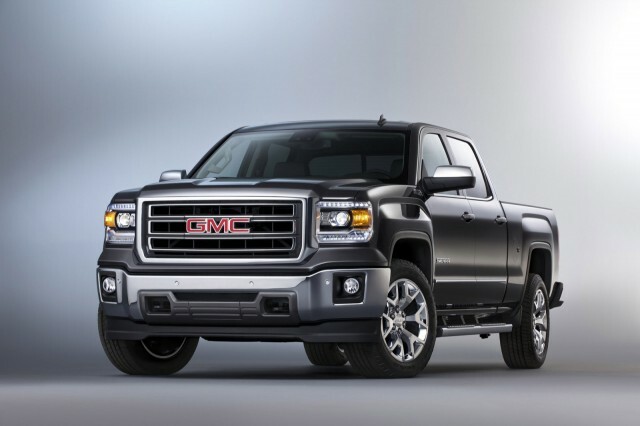 A major refresh, not quite an all-new truck, the 2014 Sierra is packaged like the outgoing model, with some worthwhile improvements. Sierra Crew Cab models are now offered with two different bed lengths—5’8” or 6’6”—while regular-cab models are offered in 6’6” or 8’ lengths and the extended-cab versions all include the middle size. 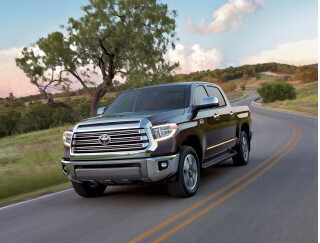 Crew Cab models get longer doors as well, with the B-pillars moved forward, resulting in easier entry and exit, and extended-cab versions get front-hinged rear doors for the first time—nearly rivaling the outgoing Crew Cab models in convenience. We prefer the Sierra's cloth seats to the leather ones with ventilated, for better comfort, but we know we're running against the luxury grain there. In the bed, the Sierra steps up with an integrated bumper step, LED bed lighting, and a damped tailgate that lowers like the glovebox on a Lexus LS. Safety features get upgraded as well, with a suite of new active-safety aids that are optional. Forward Collision Alert and Lane Departure Warning—both camera-based—can help you stay aware of hazards, and the optional Driver Alert Seat can vibrate with pulses on either side to alert the driver quickly to issues. Trailer Sway Control and Hill Start Assist are included as part of the standard StabiliTrak stability control system. All Sierras get air conditioning, keyless entry, and an AM/FM radio with a 4.2-inch color display. GMC’s IntelliLink connectivity system is optional on the Sierra; it combines full voice-command Bluetooth connectivity with Bluetooth audio streaming, a Pandora app, and available navigation, with an eight-inch reconfigurable touch screen. A 110-volt AC outlet is also on offer, and some models include up to four 12-volt outlets and five USB ports, as well as an SD card slot. Blu-Ray DVD players and different seating configurations are available. There's more to come, too. Later this year, the Sierra All-Terrain gets the optional Z71 off-road suspension, monotube Rancho shocks, recovery hooks, a transfer-case shield, hill descent control, an auto-locking rear differential, and special wheels and tires. Meanwhile, the coming Sierra Denali adds its own styling details and plush features like Bose audio and ventilated seats, plus a standard V-8 engine. More assertive this time around, the butch and blocky GMC Sierra has attitude outside, refinement inside. The GMC Sierra 1500 has been in need of a touch-up. 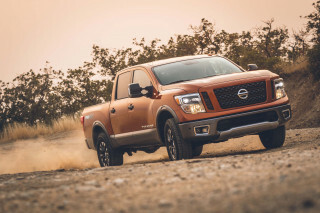 On the market since 2007, it's been the oldest full-size truck with its near-twin, the Silverado--except for Nissan's aged Titan. The new Sierra isn't a vast departure, but it is different enough to register with truck buyers, who've waved us by in our test drives with that universal gesture of car camaraderie--the letting-you-pass hat tip. By a very slight margin, we prefer the Sierra's buff, blunt grille and interior trim to the choices made for the less distinctive Silverado. Some of it comes down to the Sierra's LED lighting and projector lamps, or the big red letters embossed on the grille, as much as it does to the aluminum trim inside. The details seem crisper, the overall shape more defined, the fenders flared with more attitude. There's a lineage infused with some of the same HUMMER traits that took over GMC's Terrain, and on a truck body, they work even better, though the Sierra 1500 now looks as big as the 2500 and 3500 HD models. Inside, the dash is very upright, with a simple but bold design, and the doorsills are several inches lower than the dash top. Controls are arranged in several key areas, just to the left of the steering wheel or in a large center-stack area (with a wide center console just aft), and all the controls and displays are large and straightforward, with cool blue primary lighting, red arms on the dials and red backlighting. GMC's IntelliLink makes a colorful splash on the big LCD screen found on most models, and the rich-hued trims in the cabin are soft-touch in many places, unlike the Chevy. The ride's a bit rougher than the Ram's, but the GMC Sierra has great truck powertrains and finally, responsive steering. Most GMC Sierra shoppers will lean to one of its new V-8s for stronger performance and better towing, but the completely reworked V-6 deserves more attention than ever. It's no longer a penalty piece for utility trucks and fleets: it's an honest alternative to the V-8 for drivers that are honest about how often they tow and haul. Today's full-size trucks deliver the kinds of payload, acceleration, and towing that heavy-duty trucks did just a couple of decades ago. Recalibrating the powertrain needs of truck drivers was inevitable, and this year it happens in the Sierra. The rejiggered powertrain lineup has dropped some of the former stragglers, leaving behind a trio of powerplants that hit all the benchmarks of the class. The base engine is a 4.3-liter V-6, but don't hold any grudges with the past Vortec engines of the same name. 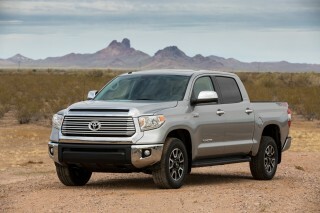 This one's a natural fit for a lighter-duty full-size truck, anything not pressed to tow more than a few thousand pounds. Without the classic V-6 burr on full throttle, it could be mistaken for a small-displacement V-8, given the low-end torque. In all, it's rated at 285 horsepower and 305 pound-feet of torque, which we'd peg at a 0-60 mph time of about 8.0-8.5 seconds, with a smartly-geared six-speed automatic running shift plays. It's efficient--direct injection and cylinder deactivation are new--are said to boost fuel economy though EPA numbers haven't been released. And towing is up: the V-6 Sierra tows up to 7,200 pounds, a quarter-ton more than the F-150 V-6 and 700 pounds more than the best Ram V-6. If you really do tow 5000 pounds or more on a regular basis, and don't mind a couple miles per gallon in gas-mileage penalties and a minimal $895 option price, GM's 5.3-liter V-8 is the next step on the Sierra ladder. It's a muscular powerplant, good for 355 hp and 383 pound-feet of torque, and is coupled to the same sweet six-speed automatic. In the optimum configuration, this team can tow up to 11,500 pounds, and best-case scenario, that rippling exhaust note is backed by a 23-mpg EPA highway rating, thanks again to cylinder deactivation and direct injection. Later this year, the Sierra Denali sidles into the lineup, bringing with it an optional 6.2-liter V-8 that'll also be offered in the SLT model. The big eight sports 420 hp and 450 pound-feet of torque according to early estimates, which translates into unknown gas mileage but adds 500 pounds to the tow rating, for a class-leading 12,000-pound tow capacity, according to GMC. All three engines connect to the same six-speed, with a choice of rear-wheel drive or shift-on-the-fly four-wheel drive. The transmission has cruise-grade braking factored into its programming; it downshifts early to assist slowing a trailer. It also has a tow/haul mode and tap-shift controls on the shift lever for direct control, helpful when pulling a trailer and modulating power more directly to merge into traffic or to steam up grades. The transmission gives up a couple of gears to the eight-speed unit in some Rams, but it's not missed much; an eight-speed would net better highway economy, but this six-speed has ideally spaced gears and a mellow shift quality that's long been one of GM's points of pride. All Sierras carry over a reworked version of the previous truck's strut front and leaf-spring rear suspension. The steering rack is new, and electric, and specially designed brakes with long-life rotors are new for 2014. The combination nets the Sierra some large gains in responsiveness, minor ones in ride. Not quite as smooth and composed as an air-suspended Ram, the Sierra's more progressive springs front and back have become a little more absorbent, over what already was a fairly good ride. It's the steering that pays big dividends: it's quick and pretty crisp, as true to scale as the Ram's, not as overtly hefty as the F-150's. Monotube shocks come later this year on All-Terrain Sierras. Electric steering enables more features that give the Sierra a stable, planted feel even with a few thousand extra pounds depending on it. We spent an afternoon learning some finer points of trailering with the 2014 Sierra, experimenting with Tow/Haul and tap-shifts, and engaging trailer-sway mode. We also fine-tuned the trailer-brake controller fitted on our test vehicle to accommodate a 4,500-pound Airstream and took to a short slalom and cornering course before hitting California's Highway 101. The Sierra took it all into stride, composed from highway entry to exit. The biggest issue we faced, other than narrowed lanes under construction, was a state limit on trailer speed of 55 mph--it felt stable at least 10 mph beyond that. Later this year, the Sierra All-Terrain adds some undergear to this setup. It gets a Z71 off-road suspension, monotube Rancho shocks, recovery hooks, a transfer-case shield, hill descent control, an auto-locking rear differential, and special wheels and tires. It's a bundle that's also offered on the Denali. We'll bring you more on both of those editions later this year. There's more room inside the cabins of the GMC Sierra, more bed options, and lots of thoughtful touches, from bed steps to a light-touch tailgate. The 2014 GMC Sierra isn't a completely new truck--GM itself calls it a heavy refresh. That's fine, since the Sierra's cabin and bed already had the space they needed to take on a slew of jobs. The configurations change slightly, however. Regular Cabs still offer two front-hinged doors and beds either 6'6" or 8' long. Double Cabs all get the 6'6" bed, but the doors themselves are different. They're now hinged at the front, and don't require an open front door to gain access to the space behind the front seats. Crew Cabs come with four full-size, front-hinged doors and now, with a choice of either the 5’8” or 6’6” beds. In terms of access, the longer doors on the Crew Cab make it easy to clamber in the back seats, especially since the Sierra's B-pillars have been moved forward. But now that the Double Cab gets front-hinged rear doors for the first time, it's almost as capable and accessible. We've spent time in both five- and six-passenger Sierras, with bench and bucket seats, cloth and leather, and come away impressed with the much-elevated sense of quality. Soft-touch materials look more expensive and lay next to each other neatly--the aluminum trim on some Sierras is pitch-perfect--and the added gauges in the Sierra give it a more technical flourish than the more basic Silverado. Getting a good driving position is easy. Tilt and telescope are engaged with separate levers, unusual but intentional to avoid contact with the driver. Power-adjustable pedals are an option. The Sierra's smaller sideview mirrors can be overcome with the available towing mirrors, but otherwise, outward visibility is good. The gauges and displays are clear, and controls and knobs are large and easy to grab for quick adjustments to fan speed and audio volume. The Sierra's base cloth seats offer better support and comfort, we think, than the optional leather ones. The cloth is stain-resistant and woven for long life, and looks fine. It can even be heated. In our drive, the cloth seatbacks had better support across the seatback and a more comfortable bottom cushion, and it's possible ventilated seats are the reason. The leather seats come standard with heating, and ventilation is an option--and as we've found on many other vehicles, the packaging for vents flattens out the cushions. On the Sierra, you'll tilt the seats forward to strike a balance between proper support and contact with the headrests. In-cabin storage is excellent. On Sierras with bench seats, there's some storage embedded in the middle seat section, along with a trio of cupholders. Five-seat Sierras have a wide center console with cupholders, a deep rectangular storage bin, a pair of smartphone ridges, and if you order it so, up to five USB ports and two types of power points so you can recharge almost anything--GoPros, camera batteries, even laptops. There's a dual glovebox, and enough molded-in bottle holders to erase the threat of dehydration. We drove only Crew Cab models, though we've poked around other body styles on the auto show circuit. Our test truck had great rear-seat leg and head room, just as in front. But the rear seatbacks rest vertically against the bed wall, still, though the bottom cushion does flip up to create more lockable storage. The Sierra's visible quality is backed up by audible improvements. 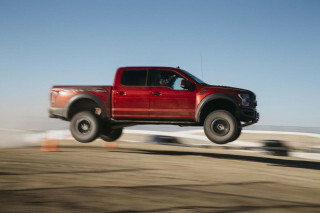 The 6.2-liter V-8 will come with active noise cancellation to calm its four-cylinder noises, and the truck's doors are sealed three times over to prevent too much wind noise from intruding into the cabin. Outside of the cabin, the Sierra adopts some extra features to make hauling and carrying more convenient. There's a new "CornerStep" built into the rear bumper of all trucks, and four cargo tiedowns that can fasten up to 500 pounds between them are included with each Sierra. There's an LED light mounted on the cab that points down into the bed, which itself has LED lighting tucked under its rim for better visibility. Inside the bed, the Sierra has at least four feet of space between the wheel wells, and five feet between the bed walls. Notches are stamped into the bed for stacking the bed or otherwise fully loading it. A factory-installed, spray-in bedliner is available. Of all the new touches, our favorite is the damped tailgate: open or raise it, and the light touch is a welcome respite from the usual slam that greets truck owners. 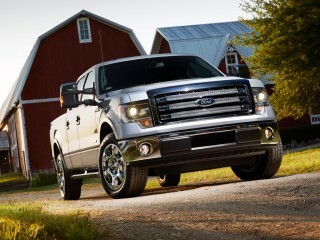 The NHTSA now gives Sierra crew cabs five stars overall, but the IIHS hasn't rated the 2014 model yet. It's been seven years since the last major update to GM's full-size trucks, and in its new iteration, the 2014 GMC Sierra taps a wealth of safety technology to boost its crash test scores. As of yet, some of those scores aren't available. The National Highway Traffic Safety Administration (NHTSA) has given Sierra crew cabs five stars overall, with all five-star ratings save for a four-star rollover resistance rating. But so far the Insurance Institute for Highway Safety (IIHS) has only put the Sierra through its frontal test--to a 'good' result. However, GMC predicts the Sierra will perform better than ever, better than the 2013 model's "acceptable" side-impact ratings from the IIHS (though it earned five stars in side impacts and four stars overall from the Feds). The truck's structure has been bettered, with a stiffer frame, a revised cab structure with pillars moved further forward, and optimized seat placement. All Sierras come with the mandatory airbags and stability control, which incorporates trailer-sway control to mitigate the wagging motion that can be induced when towing. Hill-start assist is standard, and maintains position for a couple of seconds when the Sierra launches on a grade. Available as an option or standard on most models, a rearview camera points out of the Sierra's tailgate handle, with output displayed on the color LCD screen. Front and rear parking sensors are available. There's also a safety package with lane-departure warning and forward-collision alert systems, and a safety-alert seat that vibrates the driver's seat cushion for haptic alerts. For those who tow, larger mirrors can be fitted to help guide trailers into their spots; they're recommended, since the Sierra's standard mirrors are smaller and more aerodynamic. GMC also offers a trailer brake controller, so drivers can fine-tune the amount of braking applied to the tow vehicle's electric brakes. The controls are mounted high on the dash, to the left of the steering wheel, where they're visible and easily used. We'll update this section as crash-test scores are published. GMC's Sierra gets its own flair, with aluminum trim, soft-touch materials, and standard IntelliLink on most models. With the arrival of the new Sierra, GMC has trimmed off the former WT model and added more standard features. 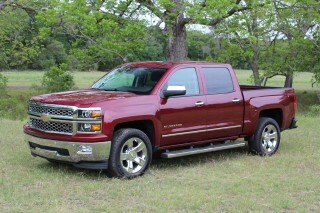 The new lineup now includes the base Sierra, the SLE, SLT, the All-Terrain, and the coming Denali. All Sierras now come with air conditioning; keyless entry; a locking tailgate; an AM/FM radio with a 4.2-inch color display; a rear step bumper; cloth seats; and the six-cylinder/six-speed automatic drivetrain, unless otherwise upgraded to a V-8. The 5.3-liter V-8 is an $895 option where the V-6 is standard, which is why GMC expects 75 percent of buyers will pay up for it. Base prices start from $25,085 for the Sierra Regular Cab with rear-wheel drive, rise to $29,110 for the Double cab, and reach $33,210 for the Crew cab. Most Sierras will be sold at the SLE trim level or above, which means power windows, locks, and mirrors will be included (though GMC hasn't released final features for each model), and likely, a CD player. For utility the Sierra will offer a 110-volt outlet in the cabin, alongside as many as four 12-volt outlets, five USB ports (swoon), and an SD card slot. GMC’s IntelliLink connectivity system is an option on the 2014 Sierra. It combines Bluetooth connectivity, audio streaming, and voice commands with mobile app connectivity (Pandora, for example) and available navigation, all delivered through a larger, eight-inch reconfigurable touch screen. The system is essentially a version of Cadillac's CUE interface, without the haptic feedback. We think its graphic layer is cleaner and brighter than Ford's MyFord Touch system, and the configurability gives it some distinction over Ram's UConnect, but in our Sierra test drive we encountered a few instances where the navigation system couldn't refer to its own contact database. The Sierra also can be equipped with 3G onboard data as a dealer-installed accessory, with wireless connectivity for up to ten devices, as in the Silverado. Leather seating will be available, with heating and ventilation for different seating positions, depending on the model. A sunroof and a Blu-Ray rear-seat DVD entertainment system will be stand-alone options on almost all versions. There's also a safety package with lane-departure warning and forward-collision alert systems, and a safety-alert seat that vibrates the cushions for haptic alerts. For more entertainment, GMC will offer a Z71 off-road package. It comes with hill descent control, skid plates for the transfer case, and Rancho shocks. A trailering package includes connectors for lighting and an automatic locking rear differential. It also adds heavier-duty cooling, a beefier rear axle with a 3.73 ratio, stronger rear leaf springs, and a trailer-brake controller. The Sierra All-Terrain package comes only in the four-door body styles, on either the SLE or SLT trim. It gets a painted grille and the Z71 off-road suspension, as well as an automatic locking rear differential for quicker reaction times. On the SLE it gets an ebony interior and front bucket seats; the SLT version has seats with carbon fiber-look trim. Finally, the Sierra Denali returns as the plushest truck of all. 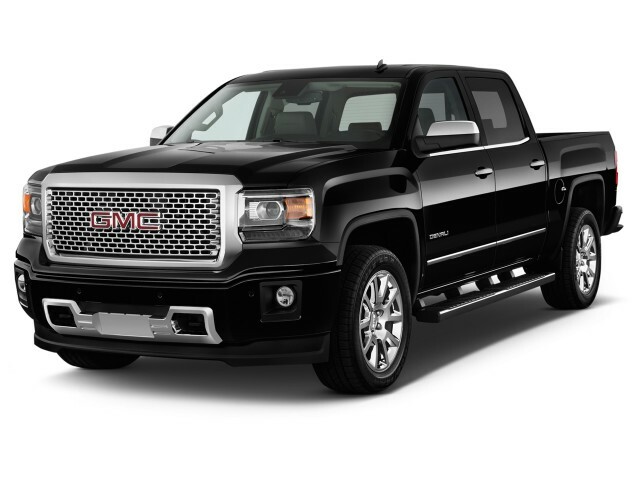 The third such GMC truck in history, the Denali gets its own 20-inch chrome wheels and a chrome grill; body-color bumpers; aluminum trim on the dash; and LED daytime running lights. Among the functional upgrades are an eight-inch LCD display in the gauges that can be customized to show audio, phone, navigation, or other settings. Color Touch navigation and IntelliLink smartphone connectivity are standard, as are five USB ports, Bose audio, ventilated front seats, front and rear parking sensors, and a heated steering wheel. The Denali hasn't been priced yet. Much-improved V-8 gas mileage makes it a real V-6 alternative in the new GMC Sierra--if only the new V-6 weren't so good. The GMC Sierra's powertrains are shared with the 2014 Chevy Silverado, and posts identical fuel economy numbers. Those EPA figures settle in at 16 miles per gallon city, 23 miles per gallon highway, or 19 mpg combined, for trucks with the V-8 and rear-wheel drive. With four-wheel drive, the V-8 and six-speed combination nets fuel economy of 16/22 mpg, or 18 mpg combined. Those numbers represent a significant gain over the previous GM V-8 lineup, even though the automatic transmission hasn't gone to the eight-speeds now found on the Ram 1500. GMC says it's due to more efficient body construction (the trucks weigh about as much as an Audi A8) and the use of cylinder deactivation on both the V-8 and the V-6 engines. When driving loads are lighter, the truck shuts off four cylinders on the V-8, running it on the remaining cylinders until driving demands increase. The increases in vibration and noise are offset by more sealing and on the V-6, with a balance shaft. The big V-8 also gets active noise cancellation, we've heard. Cylinder deactivation is applied to the V-6, even, but it's not across three cylinders, just two. Those V-6 powertrains are rated at 18/24 mpg or 20 mpg combined with rear-wheel drive, or 17/22 mpg or 19 mpg combined with four-wheel drive. 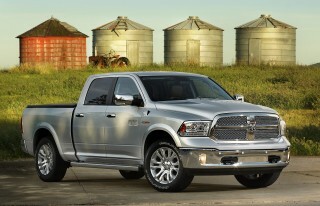 Those numbers are close to the ones posted by the V-6 Ram 1500, even without the Ram's eight-speed automatic. Both engines run on regular unleaded gasoline. 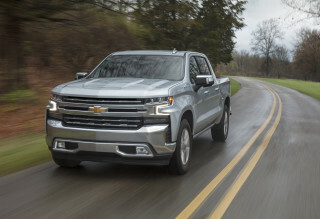 No plans for diesel engines have been announced, and the former Chevy Silverado mild hybrid won't be making a comeback. 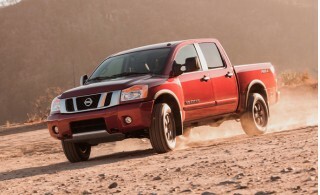 No gas-mileage figures have been released for the 6.2-liter V-8. We'll update this review as soon as figures are available. Changes made: Borla 1MM mile Exhaust system, K/N Air Filter and Michelin Defenders. Not babyed, but not beat up. Well maintained. Best features: Performance, Heated and cooled seats, heated steering wheel, sliding rear window, Bluetooth for phone & remote start.